To prepare the dressing: In a food processor, combine the shallot, vinegar, lemon juice and mustard, and process to combine. Slowly add the oil, whisking to incorporate. Add the salt, pepper and basil, and pulse until well-blended. Taste for seasoning. 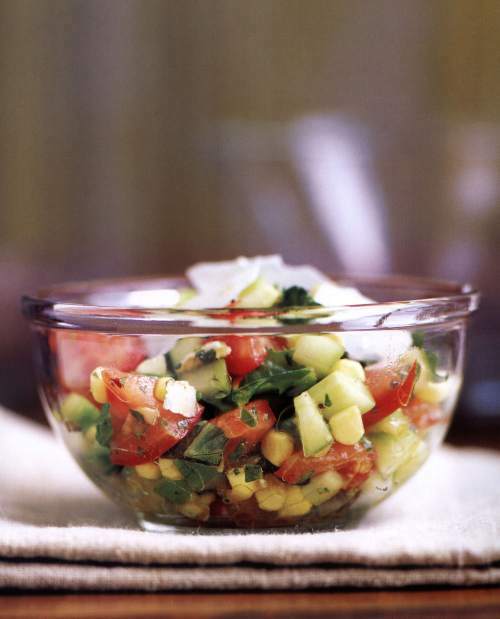 To prepare the salad: Combine all the salad ingredients into a large salad bowl. Add the dressing and toss until all the vegetables are well-coated. Transfer to serving plates and garnish with avocado slices. Sprinkle freshly ground pepper on the salad if desired, and serve. Note: To remove the corn kernels from the cob, break the husked corncob in two. Hold each half vertically, resting it on the blunt end for stability, and slide a chef’s knife down the sides, releasing the corn kernels. To toast the pistachios, place them on a baking sheet in 350-degree oven and toast for 3 to 5 minutes. Cool. Some other flavor additions or substitutions you might consider include sweet red or orange bell peppers, cucumbers, provolone, feta cheese or even olives. Another favorite of mine is to chop up chilled, grilled vegetables and top with some goat cheese. For a more substantial main-course salad, add cooked chicken or seafood.